Easy Media Creator is a suite of programs aimed at those wanting to create various types of CD and DVD media. This includes videos and slideshows, as well as data, audio and back-up discs. Indeed, Easy Media Creator includes a lot more than the basic authoring programs. It can create disc labels, enhance and edit digital photos, play videos, transcode videos for playback on an iPod, PSP or mobile phone, create calendars and greeting cards and several other options that add value to the product. All this is in addition to the core DVD authoring facilities covered by this review. It's a good list, provided you need those features. The box contains two CDs, one with the program and another containing extra content - backgrounds, transitions, menus and so on. The Media Import component enables you to import images, video and sound from a variety of digital devices and analogue capture cards, as well as from CDs and DVDs. Media Manager then helps you organise your data and find specific items, by name or keyword. Media can be shared across a network, meaning you can use a central store for several users. Setting up a slideshow was easy using one of several "Assistants" the program provides, although the range of transitions wasn't as comprehensive as with Nero 7. The final DVD was of excellent quality, though. There are two ways of creating video DVDs. The simple method is to use the Video Compilation mode of the Disc Copier. Just select some video files and a menu style and press Burn. This is easy, but you only get one menu and there's no option to add chapter menus or any other navigation. If your needs are more complex, you need the VideoWave and MyDVD components. VideoWave is a video editor that creates video files from still and video images from various sources, adding effects, transitions and audio tracks. All of this is easily done with a few mouse clicks. Finished videos can be output in a number of formats, including direct to a DV camcorder. MyDVD is then used to assemble the tracks into a DVD, complete with menus. 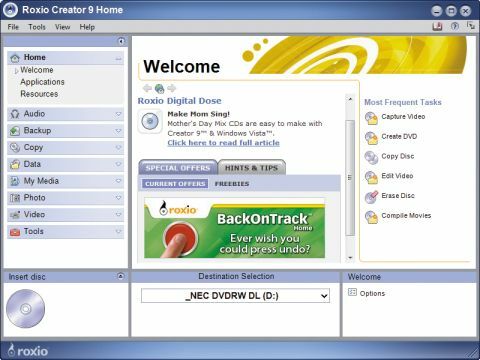 MyDVD is as easy to use as the rest of this suite. Adding videos automatically inserts them into the main menu. You can then edit titles and change the menu theme and background image until you're happy with the layout. Sub-menus can be created just as easily. Easy Media Creator has a well laid-out GUI with everything sensibly grouped and accessible from the home window. Each component is a separate program, so you can run more than one part at a time, say transcoding in VideoWave while editing menus in MyDVD. The 250 plus page manual and online tutorials in each component will help you to get the most out of it. Roxio and Nero have dominated the DVD creation space for so long, and as we've shown there's some very good reasons why that's the case. At a competitive price tag the latest Roxio tool is one that you'll come back to time and time again.